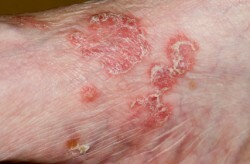 Psoriasis is a chronic, inflammatory disorder of the skin. It is the result of an abnormally rapid multiplication of the cells of the epidermal layer of the skin. Psoriasis has some very distinctive characteristics. The main of these is the psoriatic lesion as it is sharply defined against the normal skin. Sitting on top of the dark red lesion is a layer of silvery scales. Those who suffer from psoriasis know it as an irritating, recurring skin condition that can be both unsightly and debilitating. Few however understand the reason behind it…. why they have itchy, red patches over their body covered with silvery scales. Psoriasis tends to run in families although not all family member will develop it. There appears to be a genetic defect causing the overproduction of keratin. This genetic problem lies dormant until triggered by an environmental stimuli. How do you Treat Psoriasis? Psoriasis treatments are many and varied. They range from topical (applied to the skin), systemic (taken internally) and phototherapy (ultraviolet light applied to the skin). Whilst some psoriasis treatments are used individually the possibility of combining the treatments offers greater hope for those who struggle to find therapies to assist with the chronic condition. Psoriasis is a non-contagious, chronic skin disease that comes in different forms and varying levels of severity. Unfortunately there is no magical cure for psoriasis. Treatments are aimed at controlling the symptoms and slowing the rate of skin cell production.